When heading out into the wilderness, one must always plan ahead, study the route and weather predictions, carry the correct gear, and have a back-up plan. Perhaps these rules are never more true than when winter backpacking. Knowing your the route, the weather, the abilities of your crew, how to properly use your gear and having some survival skills make a fun time out of a potentially dangerous situation. 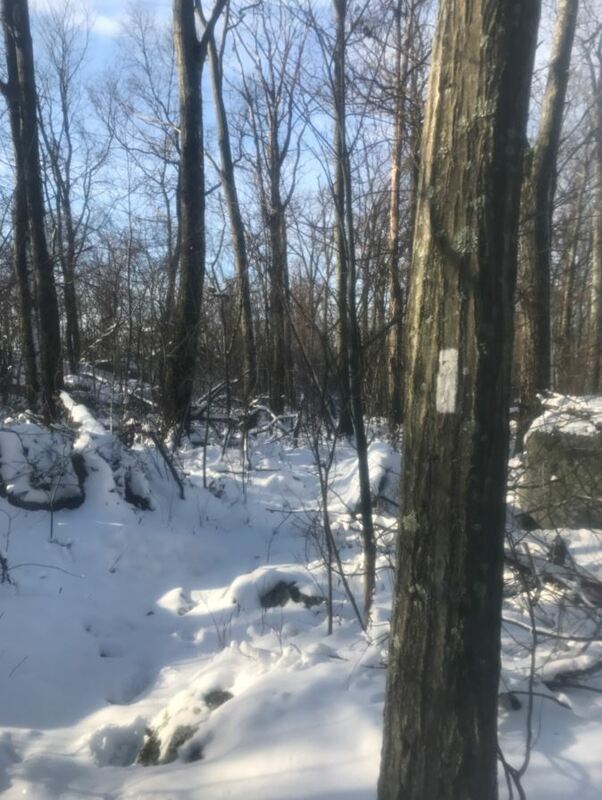 This weekend I set out with members of Hudson Valley Hikers on an a somewhat ambitious plan to backpack 32 miles of the AT near Duncanon, PA. Our original intention was to hike 13.5 miles from Clarks Valley Road to Clarks Ferry Shelter on Saturday, and then 18.5 miles from there to Sherwood Road on Sunday. 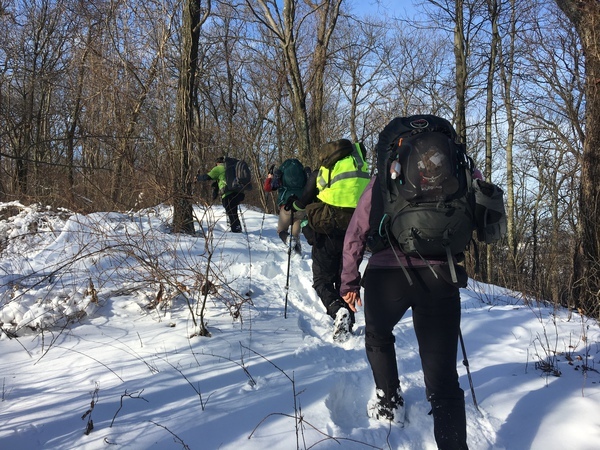 When the forecast changed to rain on Sunday, we altered the plan to hike 19 miles Saturday and stay at a hiker hotel in Duncanon then finish the 13 miles on Sunday to Sherwood Road. 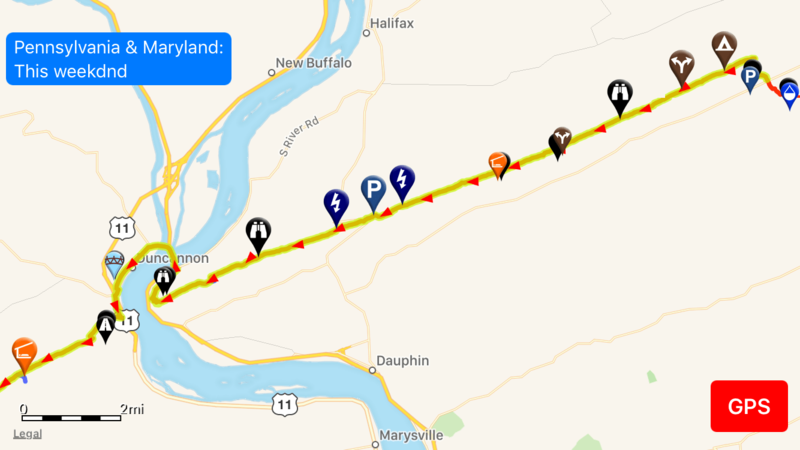 Our plan for the first day of this winter backpacking trip was to hike 19 miles from Clark Valley Road to the Doyle Hotel in Duncannon, PA.
We met at 6:30 AM at Sherwood Road on Saturday morning, left a car there, and then shuttled to Duncanon where we left another car. Then we drove to our starting point at Clarkes Valley Road. We started hiking up the moderate grade at 8am. Snow at the base of the mountain was 1-3 inches, increasing to 4-5 inches by the time we got to the ridge at 1300 feet elevation. Along the ridge were drifts possibly deeper than 8 inches at times. 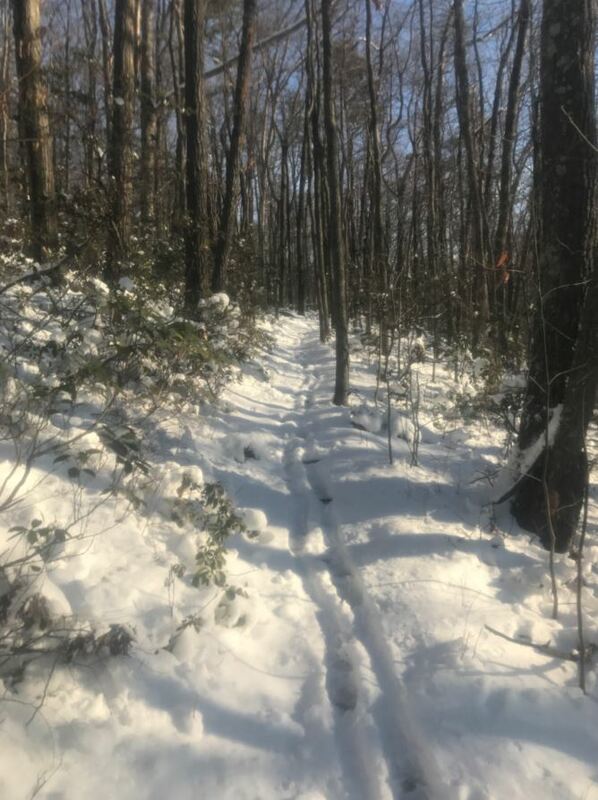 We were shocked to only be making about 1 mile per hour for the first few miles, but pleased to accelerate to a little more than 2 mph along the flat ridgeline. Our crew making the 1000 foot climb from Clark Valley Road to the top of Peter’s Mountain on a Winter Backpacking Trip. This is when time management started to become an issue. We took a generous 30 minute break at 10 am to eat snacks and hydrate, then kept moving. We arrived at Peters Mountain Shelter, 7 miles into our hike, at 12:00 and decided it was a good place for lunch, despite only having taken a break 1.5 hours ago and not making our halfway point. Because the ground was covered with a good layer of snow and the spring was inconveniently far away, we decided to melt snow to refill our water and make hot meals. Because of a glitch in my MSR Whisperlight stove, this lunch break turned into another hour-long layover and cost just over half of my fuel. 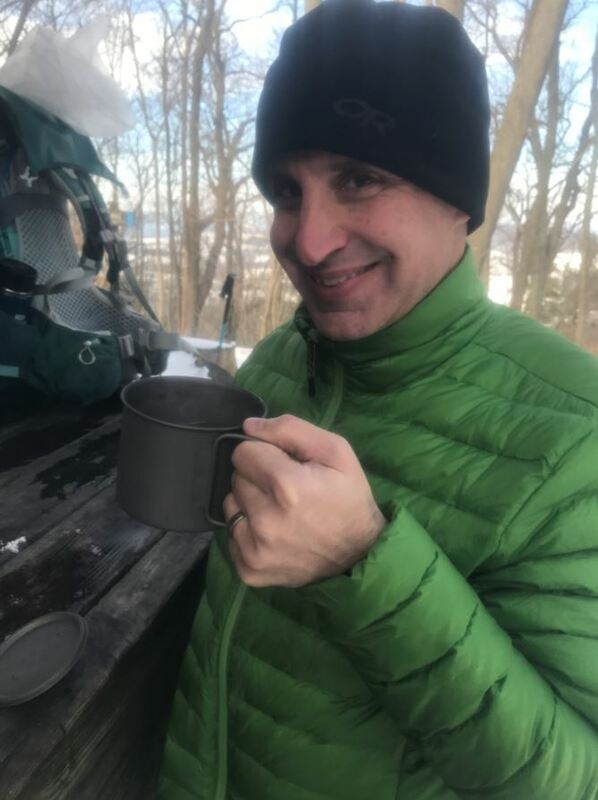 Hot beverages are a great way to keep a crew happy while winter backpacking. After lunch, we really needed to make up time, so I sped us up to a forced 2.5 mph. By this time, the sun and other hikers had really trampled the snow and going was fairly easy. We quickly came to Peter’s Mountain Road parking area at 10 miles, a popular starting point for day hikers. Beyond this point, however, the snow was mostly unbroken and the trail was rocky and difficult. At this point, we really slowed down again as several members of our group grew tired. By the time we came to Clarks Ferry Shelter, it was 5pm and the sun was low in the sky. By now one of our hikers was really suffering from fatigue and was fearful of the rocky trail and steep descent ahead. The two of us decided to stay at the shelter for the night while the other three went ahead to the hotel. Trudging through snow, or post holing, is generally considered poor etiquette, but for much of our hike the cover was less than 5 inches deep temperatures were supposed to melt much of it within the next 24 hours. Arriving at the shelter, we set up camp and got to work gathering firewood. Most of the wood in the area was drenched from wet snow, but there was a decent amount of dry kindling sticking up in the sunlight. I used my bushcraft knife to make fuzzy sticks out of much of the larger wood so that it would dry out and ignite more readily, then started the fire with lint and shavings from an Esbit tablet. We got the fire going easily, then started melting snow in my large 2.5 liter pot. By 8 am we had eaten dinner, refilled our water bottles, and recharged our spirits, then settled in for bed. Being able to make fire from wet wood is a potentially life-saving skill when winter backpacking. Meanwhile, the three remaining hikers were crossing a rocky narrow ridge. The trail along here snaked back and forth across the edge-like ridgeline. The area was rocky, and the snow on the north facing slope was still deep and slippery. A mile along this section cost our group their remaining sunlight. Fortunately, the last descent was made easy with a series of well graded switch backs and stone stairs. They made it to the parking area at US 22 by about 6:30, but still had a 3 mile road walk to the hotel. By 7:30 I had a photo of the beer they were drinking and knew they were fine. 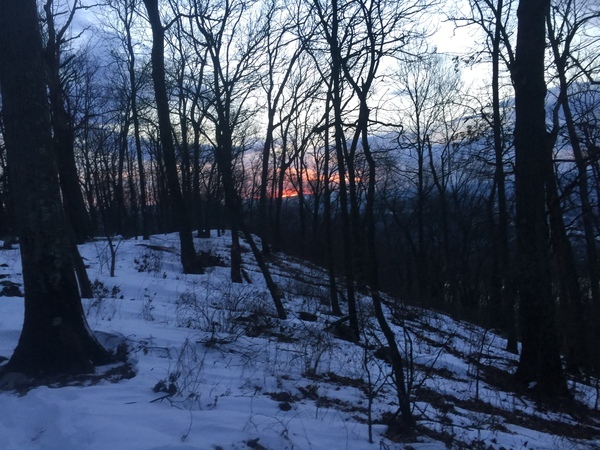 The sun sets beyond a narrowing ridgeline along the AT above Duncanon, PA. Looking at the forecast for the next day, I spotted a break in the rain at 7:00 AM. This lined up with sunrise perfectly. We made a plan to wake up at 6am, have a quickly breakfast, and get moving as soon as the light was bright enough. We did exactly like this, using my remaining stove fuel to boil water for coffee and hot chocolate, and then hitting the trail. It took us just about 1.5 hours to reach the road where one of our other hikers was waiting in his car. Shortly after the sky opened up and rain was heavy. 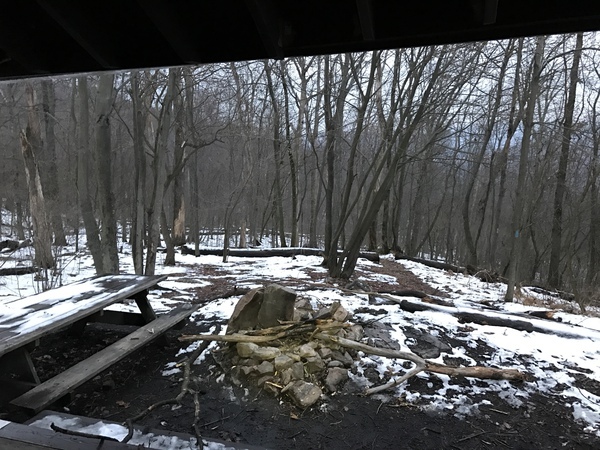 The morning view from Clark’s Ferry Shelter on day 2 of our winter backpacking trip in Pennsylvania. We were all glad not to be hiking in the heavy rain Sunday. Temperatures were just about 33 degrees and these conditions would have been miserable and dangerous. Fortunately, skills and backup plans paid off and everyone was safe. Study the weather ahead of time and be prepared to change your plans accordingly. I planned this trip for nice weather, but a heavy snow dump 2 days before our hike, coupled with the prediction of heavy rain our second day forced us to change our plans. Always have a backup plan in the back of your mind. Know your bailout points and shelter locations. Carry all of your gear, even what you don’t think you’ll need. When we decided to stay at the hotel in Duncannon, it was a tempting option to unpack our sleeping bags. The two of us who stayed in the shelter overnight were very happy to have carried the extra weight. This is another advantage of ultralight backpacking: our 0 degree quilts way just over a pound each. Carry an oversized pot and stove. 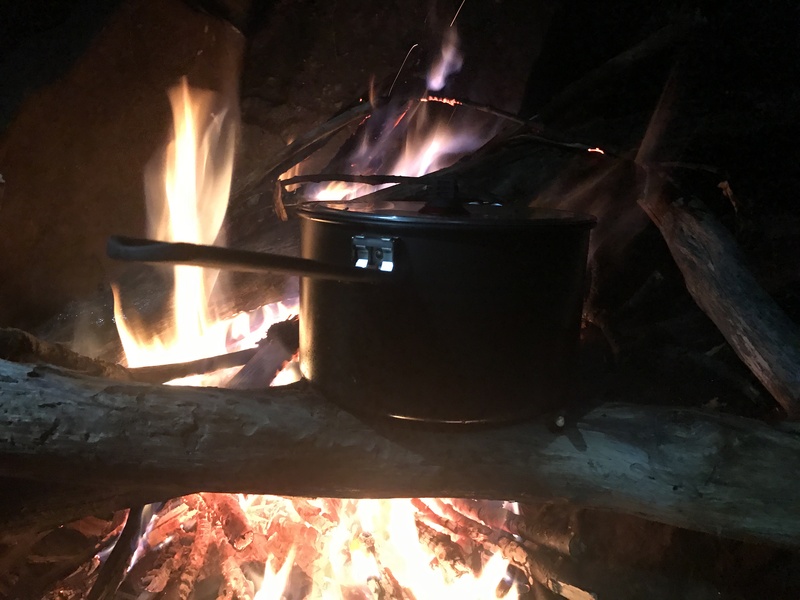 Normally when I’m backpacking, I carry a 900 ml titanium pot which I use with a small isobutane stove to boil water for myself. For this trip I carried a 2.5 liter pot and a white gas stove. The oversized pot and long burn-time of the white gas stove were ideal for melting snow into large quantities of water. I was happy to have this set up despite the extra pound of weight. Manage your time carefully. On this trip we started a little late and took two generous breaks before we even made our halfway point. These mistakes caused three of our hikers to hike 4 long miles in the dark, some of these on busy roads. Learn to troubleshoot equipment. A glitch in my stove slowed our snow melting process at lunch. This cost us both time and fuel which we could have used later on. Know your crew’s limits and know when it’s time to adjust the plan. After my tired hiker slowed to a crawl, I could have insisted that she kept moving, but she may have gotten hurt. Had she broken down any further from the shelter, we could have faced a long, difficult night in a makeshift campsite. Know how to build a fire in wet conditions. If you want to go winter backpacking, you need to be able to do this with one hand and your eyes closed. This is an absolute life saver. I’ll write some more blog posts about this shortly. Be sure to have spare batteries in your repair kit. My headlamp batteries failed at one point and it was great to have these. Keep your crew together or have a way to communicate. Cell coverage in Pennsylvania is omnipresent, but backup batteries for cell phones are a must. Conserve your battery power during the day by keeping your phone in airplane mode and only using it to take pictures. If you do have to change plans or camp unexpectedly, make it part of the adventure. Give everyone a task and keep it fun. Build a fire, feed them, share stories, and keep a smile on your face. Don’t let a change in plans ruin everyone’s time. If you keep it fun, everyone will learn and have plenty of memories to share. Awesome pix and awesome last min adjustments. Proud of everyone and I am reminded how I am not gear ready for winter backpacking just yet. Patiently waiting for the snow to melt and for temps to hit above 45. Patiently…is the key word here. I miss you guys! Have options for everyone to comfortably finish the hike. A good plan works out when foreseen things happen and plans senarios are implemented. A great plan works when the unforeseen happens and people implement deposited them! Well done all around! Hi Jay – curious, why is post-holing considered poor etiquette? I do not know much about winter backpacking (planning a small hike with very likely some snow next month). Post-holing makes things very difficult for snowshoe-ers too. If you want to hike in the snow, you should invest in a pair of snow shoes.